On Thursday, February 6th, 2014, I took my poodle Ike to the groomer. I had plans to meet the Girl Scout Moms group for dinner at a local Chinese place. I probably spent some time writing. If I didn’t do the dishes, I felt guilty about it. Also, unbeknownst to me, I lost my favorite poet. I went to Wheaton College in Norton, MA. Among all of the venerable and majestic colleges I’ve seen in New England, Wheaton is the prettiest. Beautiful old trees. A duck pond with a little Grecian temple. Brick-and-ivy dorms with gables and ells galore. I was happy there. Briefly. My mother and I spent our first and last Mother’s Weekend together that fall. Mom and I listened to Margaret Atwood’s keynote. We walked arm-in-arm, as we love to do, around the pond. My baby sister was only four, so I knew how lucky I was to have time alone with my mother. It was a dream. Nothing happened to my mom. It was my wonderful dad who got hurt. I won’t go into detail, but a couple of weeks after Mother’s Weekend, he was hit by a drunk driver. He became quadriplegic and ultimately, in the fall of my senior year, died. Apart from my friends, I thought no one knew. I’m older now. I realize that everyone knew. My professors. My advisors. The administration. Everyone. My family had been one of “those families.” My parents were deeply in love and loved their five children. We loved them right back. When Dad was injured, it was as if the whole world had been slapped across the face. I understand how people freeze when faced with a terrible situation. We didn’t know what to do. No one knew what to do. I wish I had more pleasant memories of Wheaton, but I don’t. It was a dark and confusing time for me. I wasn’t myself at all. Almost nothing made sense. Maxine Kumin’s poetry was an exception. My freshman English professor was delightfully old-fashioned. Professor Edwin Briggs called his wife,”my beloved consort.” He read the whole of BEOWULF to us in Old English. He asked us to memorize and recite poetry. I often chose the work of Maxine Kumin. Her plainspoken voice and practical turn of mind appealed to me. Like me, she loved and wrote about horses. Her JACK is a heartbreaking tribute to a long-lost horse. I remember learning AFTER LOVE (Brave Prof. Briggs! How awkward it must have been sometimes!) and I remember learning ALMOST SPRING, DRIVING HOME, RECITING HOPKINS. I found in Kumin’s words the stubborn resilience I knew lay dormant in me. Don’t get me wrong–I was a walking, talking disaster–but I smiled a genuine smile when I read her poetry. As often happens, I didn’t read her work again for twenty years. When we finally came back to Boston, I saw her name by chance in a brochure for a poetry reading (tonight!) in Harvard Square. I found childcare and raced in but missed her. Another reading was canceled due to bad weather. She was getting older, I knew, and had once been seriously injured in a carriage-driving accident. Why would she chance it? I thought about writing to her, but decided against it. Maxine Kumin left us on Thursday, February 6th, 2014. It’s okay. It’s okay because I know, although we never met, we had a relationship. She was the poet. I was the reader. She knew I was out there, reading her words, remembering her words. She was right. After her carriage accident, Maxine Kumin’s head, like my dad’s, was bolted into a brace called a halo. It’s a horrific contraption, very medieval, but when you need one, you need one. She was one of the lucky few that emerge from the halo able to walk again, to write again, to stroll out to the pasture to give an old horse an apple. I’m tremendously grateful for that. So goodbye to the friend I never met. Thank you for offering words that made sense when nothing else did. I enjoyed my first reading of Stephen King’s ON WRITING. As a matter of personal taste, I’m not a fan of his fiction, mostly because I was the anti-self-censoring kid. I clearly remember many, many books (like CARRIE) that should have been yanked out of my sweet little mitts. He’s an excellent writer, but make my King non-fiction. I expected him to be funny. He is. He’s also emotionally honest, appreciative of his family, and warmly encouraging. If I ever meet him–I saw him at a Maine rest stop once–I’ll be glad. I generally pay no attention to celebrities, and I wouldn’t recognize Justin Bieber if he ran up and slapped me, but when I saw Stephen King step out of his car and walk toward Dunkin’ Donuts, I knew it. He’s a recognizable fellow. He must dread stopping on the Maine Turnpike. King has a lot to teach writers. He expects us to shun the passive voice. He doesn’t truck with adverbs. For dialogue, “said” will do most of the time. He recommends a bracing dose of Larry McMurty to show us how much can be accomplished with “said.” I agree. Except… I write for children and that leaves me in a tricky spot. Accepted word count for a picture book text is 500 words or less. Preferably much less. Good picture book writers wield that tight word limit like a plastic surgeon wields a scalpel. They carve out stories that offer well-developed characters, clear story arcs, zingy tension, and satisfying resolutions. The very best examples, in my opinion, have something more. Delicious, nutritious language. A favorite read-aloud in our house was Charlotte Pomerantz and James Marshall’s THE PIGGY IN THE PUDDLE. It was a treasure trove of fun words and my children delighted in Little Piggy’s rebellious adventures. They cheered as she would, “…waddle, plump and little, in the very merry middle.” Gently and naturally, the book expanded my kids’ vocabularies and fed their love of reading. The adorable illustrations and lilting language were an Astaire-and-Rogers team. We loved it. Stephen King wasn’t talking about picture books. He was talking about–and to–grown-up writers who use corn-fed filler words that sap the strength of their prose. Still, as picture book word counts become more and more limited, we have to wonder what we stand to lose as the scalpel nears the bone. Children need to read adverbs. They need to read adjectives. They need to read and learn lots of ways to say “said” without saying “said.” They need words like they need vegetables and plenty of them. Most writers I know lament the scarcity of long, luxurious picture books. They still occasionally happen, and we all hope they’ll experience a renaissance. Candlewick’s gorgeous CLOUD TEA MONKEYS, written by Mal Peet and Elspeth Graham and illustrated by Juan Wijngaard, is a recent example. Books like this, however, are as rare as snow leopards. So, with the help of ON WRITING, I’ll sharpen my scalpel and have at it with my 500 words. But I hope I see more snow leopards. If you are thinking of attending the 2014 NESCBWI conference, I have good news. Writers and other bookish people are wonderfully friendly and welcoming. They are not in the least cliquish. I love them. I attended my first regional conference three years ago and since then, I have met many new colleagues. In fact, many of the people I’ve met skipped right over the colleague phase and became critique partners and friends. So take the plunge. If you live in the New England region, come to NESCBWI. While you are registering, tap the VolunteerSpot button. Volunteering is a great way to learn at least one person’s name. That, coupled with the fact that we all wear our name tags all dang weekend means that you’ll do just fine. Thankfully, some things never change. Like horses. Horses never change. I fell in love with them when I was two years old, and they are the very same creatures now as then. In a world whirling with change, that’s pretty precious. They smell the same, sound the same, act the same. They are as gorgeous, fragile, and dangerous as ever. When I was a kid, the horses I knew were ponies. Down and dirty, backyard ponies housed in old sheds. They were fenced in with a motley assortment of boards and wire. They received only rudimentary vet care. They were hardly trained and could be very unpredictable. They were good teachers, though. Nothing will teach you to hold your seat in the saddle like a sudden left-hand turn at a full gallop. Their lives were simple. They were happy and healthy animals, loved by their people, and content to trot kids through the woods for hours. Now I ride at a beautiful, beautiful barn. It was designed and built for the management of well-bred dressage horses. Every possible care was taken to make sure they would be comfortable and safe. The horses have a live-in manager to watch over them. They get dental care. Massages. Acupuncture. But you know what? They are no different in most ways from the shaggy little guys I knew and loved. They are still creatures of flight that will flee from imagined danger into very real danger in the blink of an eye. You still have to win their trust. You still have to remember to watch out for their hooves and their teeth. When I was a pony-mad girl, I only knew I loved horses and wanted to be near them. Now I know how they nourish me. For one thing, horsemanship and riding are difficult. Anyone can provide basic care for a horse, but to really understand them takes a lifetime of devotion. I love that. I’ll never, ever, learn enough and that’s okay. To ride well, whatever the discipline, takes patience and focus. To persuade a horse to participate as a partner rather than force him to obey takes delicacy and respect. Even the littlest is huge–a miniature horse can weigh 250 pounds–and they are both strong and opinionated. They do not suffer fools. My work as a writer nourishes me in a similar way. Writing is difficult and takes a lifetime’s worth of learning. I love that. I’ll never, ever, learn enough and that’s okay. Writing requires patience and focus. Even the littlest bit of writing–a 250 word picture book–is huge and opinionated. To try to force words to do anything is both foolhardy and likely fruitless. They’ll run away from you every time and once loose, are hard to capture again. Beautiful writing, like beautiful riding, takes delicacy and a respectful attitude. So I try. I try to ride well, despite achy joints and the many pressures of life. I try to write well, despite the same achy joints. Both disciplines are difficult. Both are beautiful. Some things never change, and for that, I’m grateful. Like many people, I have mixed feelings about New Year resolutions. While I’m all for self-improvement, I don’t like to see people greet the next twelve months feeling already defeated by some notion they had last January. Not me. Not anyone. Yes. Yes. Yes. We should all be better, stronger, faster. But this is a strange and challenging world. The eighty or so years we hopefully get isn’t enough time to really get the hang of it. We’re all new here. Here’s what I suggest: Try to take the year ahead as it comes. Cultivate patience and gentleness toward yourself and others. I know life feels like it’s getting faster all the time, but…it isn’t. Take a deep breath and say it again. It isn’t. The year, the month, the day, the hour, are just as long as they ever were. Claim the right to set your own pace, if only in small ways. I wish you and yours a joyful and fulfilling 2014. 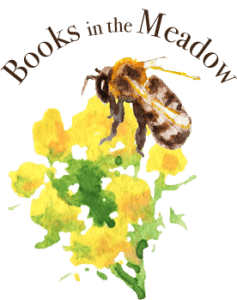 Why Books in the Meadow? There are a few reasons. I’ll start with my name. Hayley means Hay Meadow, and there couldn’t be a better choice for me. When I was born, however, it was akin to naming me Flying Unicorn. It was way, way out-there. The maternity nurses objected. My pediatrician almost threw a fit. In fact, for the rest of his tenure as my doctor, he called my mother, Freudian-slip style, Mrs. Hayley. Now Hayleys and Hailees, and Haleys and Haileighs abound. I hope they all love their names. I surely do. I spent my childhood with my nose in a book. Black Beauty, usually, but also Gypsy from Nowhere, A Pony for the Winter, or any other horse book I could get my hands on. Over time, I have rebuilt my library of favorites. I reread them and still love them. My advice? Don’t let go of your favorite books. Too late? Find them and buy them if you can. Horses are my oldest true love. Have you seen the movie National Velvet? As a girl, I was just like Velvet Brown, pining day and night for horses. My parents could have given me a bale of hay for my birthday and I would have been THRILLED. I galloped everywhere, especially through any meadow or patch of tall grass I could find. I likely still would, if YouTube didn’t exist.